Jack and Janet Hansen in the left foreground, at one of our Amish food group feeds. The evening food break was during their factory order checkout day, near the factoy in Nappanee, Indiana. The Hansens’ tow vehicle is a few years old Dodge 4X4 Diesel 3/4 ton, and as we recall it had 92,000 miles on the odometer when being taken for the Hansen’s test and check drive. Great towing report!! Janet and l had a wonderful trip back to Wenatchee from Elkhart with our fantastic new Americana. We put the unit to a wide variety of conditions and it passed them all with flying colors. In Chicago we hit exceptionally heavy urban traffic. The maneuverability of the Americana was really put to the test, it was unbelievable how well the unit moved thru the traffic. In Nebraska we encountered heavy winds in excess of 40 MPH. While others appeared to experience difficulty with the wind the Americana towed like a dream. When we stopped for the night many of the other units in the RV park were shaking with the wind. We were calm and steady. Going over one of Wyoming's high passes (nearly 10,000 Ft.) and in a raging blizzard the unit really tracked well. On the way down off the pass the brakes really worked well and we encountered no sliding at all. The next morning we awoke to find 14" of new snow on us and temperatures in the lower 20s. We were snug and warm. Alas, though Mr. Murphy paid us a visit. The Refrigerator quit on the first day out. So we converted to an icebox for the remainder of the trip. Dometic readily agreed to replace the fridge. Prior to delivering it to the RV repair shop the trucking company smashed it with a fork lift. So a second new refrigerator is on its way. I was really impressed with the towing capability of the Americana. In nearly 40 years of RVing I have not encountered such a magnificent master of the road as our unit. I found my fuel consumption in the new 35 foot rig was nearly the same as in our old 30 foot rig (a ?92 Dutchmen). The Americana outperformed the old unit in every way. Optional counter extension upgrades for the GS35/36RL triple-slide: One 16” X 40” extension will foldup toward the livingroom and one at counter’s end, extends toward the dining area (huge functional kitchen counter space). Sharon Norman (new “full-timer” from Lander, Wyoming) is standing next to her counter extensions in her GS35/36RL. Bill and Connie Anderson from Fairfield, California just took delivery of their new GS35/36RL triple-slide at our service center in So. California. 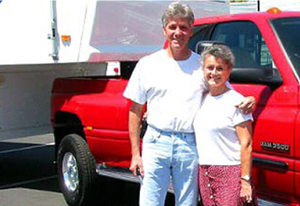 Bill was tickled that his new Dodge 3500 4X4 dually, 6 speed, Cummins Turbo Diesel - cruised up the California 6% and 7% mountain grades @ 55MPH without a struggle. Good for Dodge, Cummins and the relatively light weight and aerodynamic 4 seasons Americana model design.